We finished the night by laying hands on our pastor and praying for him. Immediately, some of our junior high kids burst into laughter. Being in such close proximity to one another was just too much for them. And yet, we prayed anyway – grateful for laughter in the midst of tears. 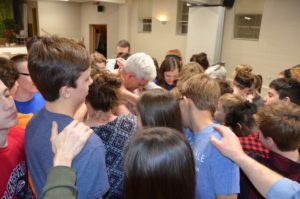 We prayed prayers of thanksgiving for what our pastor has brought to our congregation and prayers of blessing for his ministry at his new church. Then we hugged it out. The night was simple, fun, and meaningful for our pastor and teens. It gave everyone the chance to actually say good-bye. A few weeks ago, our senior pastor remarked at a staff meeting that the best gift a departing pastor can give his congregation is to say good-bye well. Saying good-bye well gives people the space to grieve and lament. It gives them finality and allows them to have closure, which, in turn, makes it possible for them to embrace whoever comes next without feeling like they’re betraying the person who’s left. That’s what we did at our party. We celebrated, yes. We laughed. We played. We remembered. And in the process, we said good-bye well. >So our student leaders also requested our pastor lead us in song during our celebration. What song(s) did your pastor lead you guys in during your celebration? Being a big music person, I was just interested to know. Our pastor plays guitar so he led an assortment of songs on the guitar. I don’t remember them all but one of them was Wade in the Water – it’s a favorite of both he and the kids!